A file photo of an inspection of the Mavallipura landfill leachate drain by the Solid Waste Management Round Table members. 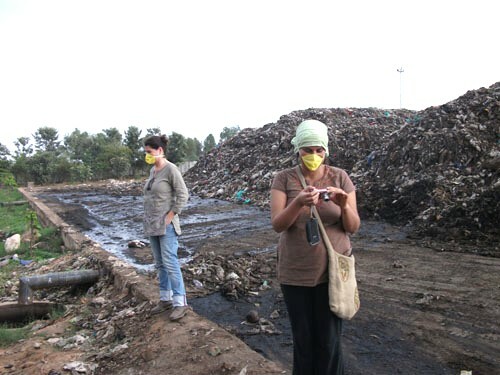 Mavallipura landfill maybe located miles away from your home depending on where you live. But the consequences of sending all our garbage to this giant bin for 10 years have been spreading to far-off corners of Bangalore ever so silently and spitefully. 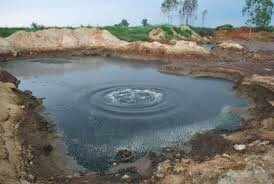 A toxic leachate tank at the erstwhile Ramky SWM landfill located in Mavallipura. Pic: ESG. So far, yet so perilously close to the disaster! Damning as it is, this evidence should have been enough for successive state governments to go on a war-footing and decontaminate the entire area through whatever sensible measures possible. Instead, three-four years later, it is talking of reopening the same landfill because Mandur is all set to erupt if dumping is not stopped by December 1. As pointed out in the previous article, water pollution in this area seems beyond remedy. Farmland has been poisoned. Livestock is vanishing by the day. A veritable buffet of diseases including cancer has been stalking the villagers. Air is filled with noxious fumes and yet, none of this seems to push the rulers and the ruled out of their ‘comfort zone’. Let’s pause and understand that it’s the garbage that’s lying in two corners of the city but the pollution has poisoned the whole well! This entry was posted in Endlessly Green and tagged Black water stream at Mavallipura landfill, Environment Support Group, Ramky leachate tank, Ramky SWM landfill, Water pollution in Mavallipura landfill. Bookmark the permalink. I am shocked and very disturbed to read this article… I am wondering what sort of governance we have voted for that have been asleep over this issue so long, an issue that can put our lives in extreme danger! We are already in danger, Sushma. Just that this pollution reaches us in a diluted form and doesn’t kill us instantly. This is what we take for granted and continue to live in our own comfort zones. If reopened, nobody has an idea as to how long dumping will go on. Yes, we should and apprise him of our concerns.